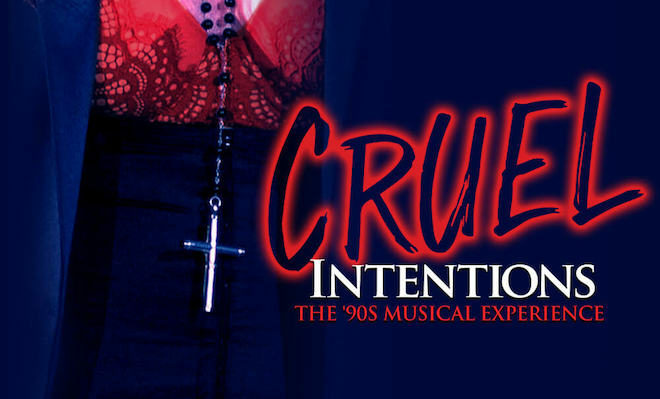 (New York, NY – Monday, December 11, 2017) Eva Price and Sucker Love Productions are pleased to announce that, due to popular demand, CRUEL INTENTIONS – the new musical nightlife experience based on Roger Kumble’s 1999 cult-hit film – has added a three-week extension to its New York Premiere engagement. The musical, which opens tonight at downtown hotspot (le) Poisson Rouge (158 Bleecker Street), will now play through Monday, February 19, 2018. Tickets are on sale now via CruelMusical.com. Set to the greatest pop and rock hits of the ‘90s and songs from the film’s iconic soundtrack, the CRUEL INTENTIONS musical is created by Jordan Ross, Lindsey Rosin and Roger Kumble, with immersive stage direction by Lindsey Rosin, choreography by Jennifer Weber (KPOP, The Hip Hop Nutcracker), and Music Supervision & Arrangements by Zach Spound. The show stars Lauren Zakrin (The Great Comet of 1812; Rock of Ages) as Kathryn, Constantine Rousouli (Wicked, Ghost) as Sebastian, Carrie St. Louis (Rock of Ages, Wicked) as Annette, Jessie Shelton (Hadestown; 36 Questions) as Cecile, Alex Boniello (Spring Awakening) as Blaine, Brian Muller (“The Good Wife”) as Greg, Matthew Griffin (The New Yorkers at Encores!) as Ronald, and four-time Emmy nominee Patricia Richardson (“Home Improvement”) as Mrs. Bunny Caldwell. CRUEL INTENTIONS is an exhilarating and deceptively funny new musical that pulls you into the manipulative world of Manhattan’s most dangerous liaisons: Sebastian Valmont and Kathryn Merteuil. Seduced by revenge and fueled by passion, the two diabolically charming step-siblings place a bet on whether or not Sebastian can deflower their incoming headmaster’s daughter, Annette Hargrove. As the two set out to destroy the innocent girl – and anyone who gets in their way – they find themselves entangled in a web of secrets, temptation, and the cruelest game of all: love. Staged at (le) Poisson Rouge, complete with bar and table service, audience members are thrown into ‘90s euphoria as the intoxicating story unfolds around them, set to the greatest throwback hits of the decade by such artists as Goo Goo Dolls, No Doubt, R.E.M., Ace of Base, Jewel, ‘NSYNC and more – in addition to songs from the film’s iconic soundtrack such as “Bittersweet Symphony” by The Verve and “Colorblind” by Counting Crows. CRUEL INTENTIONS is produced by Eva Price and Sucker Love Productions, and features Costume Styling by Tilly Grimes, Sound Design by Robert Bradley, Lighting Design by James Kolditz and Props Design by Carolyn Mraz. The show debuted at The Rockwell Table & Stage in Los Angeles in 2015, where it ran for 38 sold-out performances, before being remounted for a second sold-out run at LA’s Prospect Theatre in November 2016. In February 2017, the musical played a “pop-up” engagement at (le) Poisson Rouge, which was a sold-out smash success. The regular performance schedule is: Mondays at 7PM, Saturdays at 5PM & 8PM, and Sundays at 3PM & 7PM. There are no performances on: December 24-25, December 31-January 1, and January 13-15. Performances have been added on: Wednesday, December 20 at 7PM; Thursday, December 21 at 7PM & 10PM; Friday, December 22 at 8PM, Tuesday, December 26 at 7PM & 10PM; Wednesday, December 27 at 7PM & 10PM; Thursday, December 28 at 7PM & 10PM; Friday, December 29 at 8PM; Saturday, December 30 at 5PM & 8PM; Wednesday, January 17 at 7PM; Thursday, January 18 at 7pm; Friday, January 19 at 8pm; Tuesday, January 23 at 7PM; Thursday, January 25 at 7PM; Friday, January 26 at 8PM. General admission tickets are $49 for standing room, $79 for table seating, and $109 ‘Secret Society’ tickets which are in a reserved, premium seating location. All seated tickets require a 2-beverage or food minimum. Cruel Intentions is a 13+ show. Those under 18 can be admitted only if accompanied by a legal guardian. Tickets are on-sale via www.CruelMusical.com or can be purchased in person at the (le) Poisson Rouge box office (158 Bleecker Street) between the hours of 5:00-8:00PM Monday-Saturday. MATTHEW GRIFFIN (Ronald Clifford) Matthew is thrilled to be joining the cast of Cruel Intentions: The Musical. He has most recently been seen in the New York City Center’s production of: Encores!The New Yorkers. Further theatre credits include: Beauty and the Beast, Dreamgirls, Sweet Charity, and Much Ado About Nothing.The arts have also led him to perform shows in various cities in the U.S., South Korea, Ecuador, and France. Am immeasurable thank you to God, my amazing family, CITSTS, Yvonne, Professional Artists, and Henry Russell Bergstein! PATRICIA RICHARDSON (Mrs. Bunny Caldwell) was given her Actor’s Equity card on her first audition in New York from Arthur Laurents to understudy Louise/Gypsy in Angela Lansbury’s Broadway production and tour of Gypsy. From the small parts she played in Gypsy she got an agent and commercials, which subsidized several years of doing New York theater. She created parts in two Beth Henley plays in NY: The Miss Firecracker Contest (MTC), and The Wake of Jamie Foster (Broadway). Other roles she created include Janice in Michael Weller’s Loose Ends (Broadway), and several shows at the WPA Theater (including Cruise Control by Kevin Wade) and a few at Playwright’s Horizons (a revival of Company w/Peter Evans, Walter Bobbie, Christine Baranski). In more recent years: I Forgive You Ronald Reagan (Samuel Becket Theater), the world premiere of Alfred Uhry’s Apples and Oranges directed by Lynne Meadow at the Alliance Theater and two plays at Buck’s County Playhouse, M’Lynn in Steel Magnolias w/ Jessica Walters and Susan Sullivan, and last summer, Other Desert Cities , directed by Sheryl Kaller. TV and Film: “Home Improvement” (Four Emmy Nominations, two Golden Globe Nominations), “Strong Medicine,” (two Prism Award Nominations), “The West Wing” (recurring the last two seasons). Ulee’s Gold ( Independent Spirit Award Nomination) . Most recently, IFP 2017 recipient Cubby and County Line. She also just did the pilot for “Dayworld”, an animated series w/Tim Heidecker for Adult Swim. Patricia is the National Spokesperson for CurePSP, is on the National Board and was recently elected First VP of the LA Local Board of SAG-AFTRA. CONSTANTINE ROUSOULI (Sebastian Valmont) is ecstatic to be reprising the role of Sebastian Valmont. He has been with the show from the very beginning and is extremely grateful to be able to share it with NYC. TV: “How To Be A Vampire” (CW Seed) PBS special Broadway at the White House. Broadway: Wicked (Fiyero) Hairspray (Link Larkin) GHOST (Sam Wheat u/s). National Tours/Regional: Legally Blonde (Nikos/Padamadan, u/s Warner Huntington III) HAIR (Hollywood Bowl). Love to his parents, family and friends! JESSIE SHELTON (Cecile Caldwell) recently starred opposite Jonathan Groff in Two-Up’s 36 Questions Podcast. Theatre highlights include Hadestown (NYTW), Futurity (SohoRep, Ars Nova), The Black Crook (Abrons), Lady Han (Incubator), The Skin Of OurTeeth (TFANA). Film/Media: Feast of the Epiphany, and the recently released Hadestown original cast live album. Ed: CMU, MXAT, RITL. Thanks to Teresa, Frankie, Kym and Andy. Love to M&P and Maya most of all. JORDAN ROSS (Co-Creator) is a writer/producer from the suburbs of Philadelphia. He is currently writing for E!’s The Royals. After graduating from Temple University in 2010, he relocated to Los Angeles upon optioning his first screenplay, Rock Way, to Dolphin Entertainment. He spent three years as executive assistant to Dan Dworkin and Jay Beattie, the creative minds behind El Rey’s Matador, MTV’s Scream, and ABC’s upcoming series, The Crossing. Last year, he co-executive produced/co-wrote NBC’s Cruel Intentions television pilot and debuted an indie/alternative jukebox musical based on Nicholas Sparks’ best-selling novel/film, A Walk To Remember, which he directed. JENNIFER WEBER (Choreographer) Credits include: KPOP (Ars Nova), Stockholm (Stageworks, Hudson), PBS’s Odd Squad Live! (National Tour). Direction/Choreography: The Hip Hop Nutcracker (annual holiday tour) Decadancetheatre (Jacob’s Pillow, The Apollo, Kennedy Center, London’s Southbank Center, New York City Center, and The Stanislavsky Music Theatre, Moscow). Commercial direction/choreography: Marc Jacobs, CK2, American Express, Ulta, L’Oreal, Reebok, and Philosophy. Weber also directed the 2016 and 2017 national tours of Lifetime’s Bring It Live! jenniferwebernyc.com. ZACH SPOUND (Music Director) is a writer, actor, and composer. He has been the music director, orchestrator, and arranger of Cruel Intentions: The Musical since its inception in 2015. He was a featured songwriter at the 2016 Johnny Mercer Songwriters Project in Chicago, was a winner of the 2016 NMI/Disney New Voices contest, and is currently developing his first full-length musical, LEAP. His music has also been heard at 54 Below as part of “FutureFest.” As an actor, credits include Once (South Coast Repertory), Murder For Two (Geffen Playhouse), and Floyd Collins (La Mirada Theatre For The Performing Arts). EVA PRICE (Producer) is a Tony Award-winning producer whose credits include over 15 Broadway plays, musicals, and concerts. She is a member of The Broadway League’s Board of Governors and was named one of Crain’s NY 40 Under Forty Rising Business Stars. Current and notable productions include: Dear Evan Hansen (6 Tony Awards); On Your Feet! (The Story of Gloria and Emilio Estefan); Frankie Valli and the Four Seasons on Broadway! ; Peter and the Starcatcher (5 Tony Awards); Colin Quinn Long Story Short (directed by Jerry Seinfeld); Annie (Tony-Nominated Musical Revival); The Merchant of Venice starring Al Pacino (Tony-Nominated Play Revival); Carrie Fisher’s Wishful Drinking; The Addams Family (starring Nathan Lane and Bebe Neuwirth); as well as several solo shows and critically acclaimed concerts starring The Temptations & The Four Tops; Kathy Griffin; Lewis Black; and Hershey Felder. Recent off-Broadway projects include the Drama Desk-nominated Found (Atlantic Theater Company & Philadelphia Theater Company); Benjamin Scheuer’s award-winning The Lion (Drama Desk winner, Off-West End winner for Best Musical); and Bess Wohl’s critically acclaimed Small Mouth Sounds. International and Touring Credits include: The Hip Hop Nutcracker, featuring Rap Icon Kurtis Blow, Carefree: Dancin’ with Fred and Ginger (Directed/Choreographed by Tony Winner Warren Carlyle), as well as The Magic School Bus, Live! The Climate Challenge; Ella, a bio musical about the life and music of Ella Fitzgerald; ‘S Wonderful: The New Gershwin Musical; Tomie dePaola’s Strega Nona The Musical, Irving Berlin’s I Love A Piano (National Tour and Japan), The Great American Trailer Park Musical, Private Jokes, Public Places (London). For five years Eva worked as an assignment editor and coordinating producer for special projects at ABC News, spending her last year producing and reporting on stories relating to Broadway for ABCNEWS.COM. Upcoming: Alanis Morissette’s Jagged Little Pill.